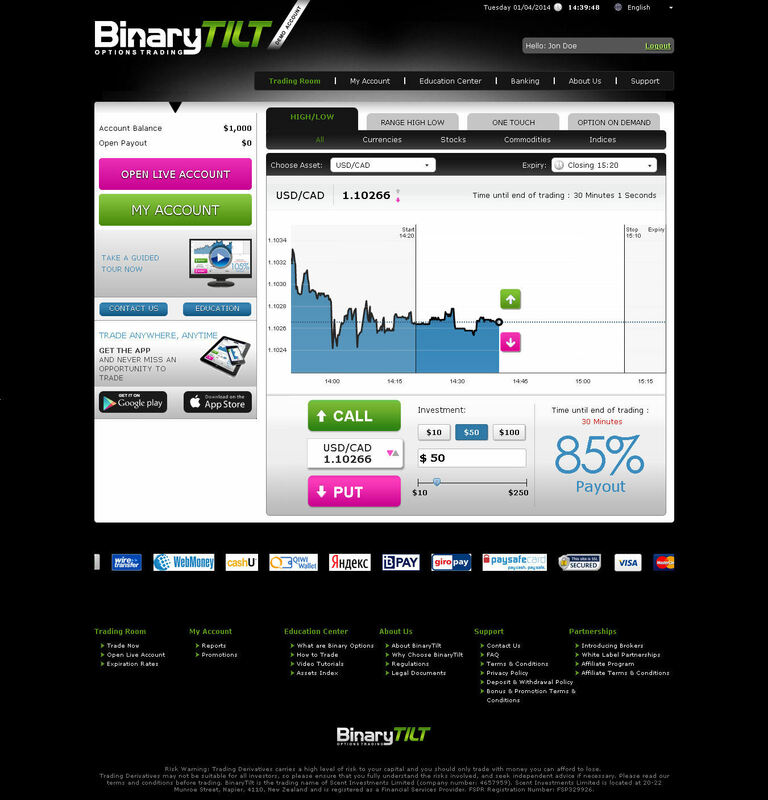 BinaryTilt is no longer operating as a binary options broker. The review presented below is no longer applicable and is presented for archive purpose only. BinaryTilt is a broker based in New Zealand and operated by a company called Scent Investments Ltd. For the most part, this appears to be a very impressive company with a lot to offer—except for one major defect in the area of customer service. Their website is one of the best organized and easiest to navigate that I have seen since beginning these reviews, and finding comprehensive information on their trade features was almost effortless. The company is registered as a New Zealand Financial Services Provider, FSPR # FSP329926. On top of that, they are part of an organization called Financial Services Complaints Limited (FSCL), which provides oversight and arbitration for disputes. Nobody was staffing the chat desk, despite the assertion that they offer 24/7 service, which was a big disappointment. First let’s take a look at the good, and then we’ll go on to the bad. It takes just minutes to get started on BinaryTilt. 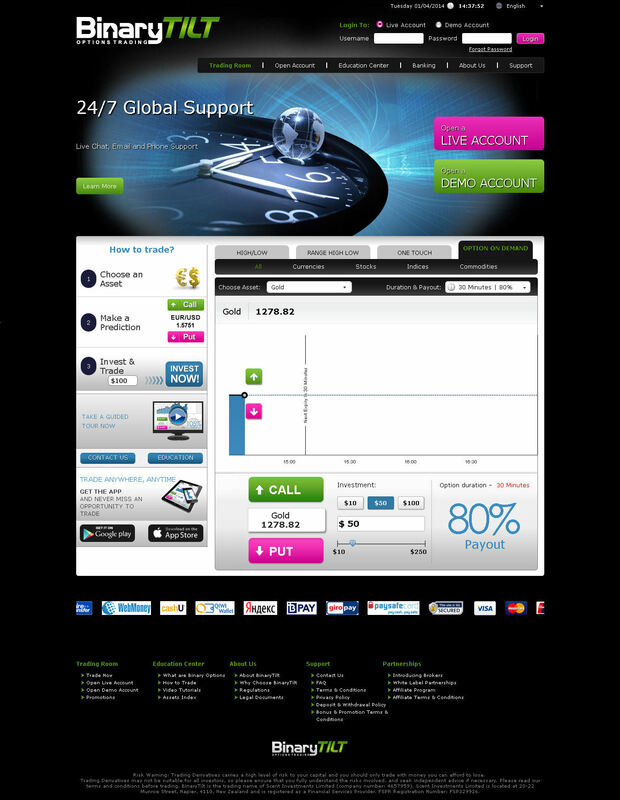 You can easily find the “Open Live Account” link, and you do not even need to talk to a customer service agent about it. Within minutes you can start practicing. This is a wonderful feature, one which is sadly lacking on many other binary options websites. You can trade risk free this way for as long as you would like, and then when you know you have a shot at being profitable, you can start trading for real. When you are ready to trade, you can deposit using credit or debit card, wire transfer, or a wide variety of e-wallets. There is a huge selection of currencies available to trade in beyond the standard US Dollars, British Pounds, and Euros. You can also trade in New Zealand Dollars, South African Rand, Australian Dollars, Canadian Dollars, Japanese Yen, and Chinese Yuan. The minimum deposit is the standard $200; there are no account tiers. Welcome bonuses up to 100% are available (for any size of deposit, presumably), along with four risk free trades to start with. This site is designed with all kinds of traders in mind. You can trade with as little as $10, while the maximum for any given trade is quite hefty – $10,000. You can have up to five trades at a time open, but this site would be pretty useless to anyone with a lot of money to invest. It may be perfect for traders starting out with very little, however. The minimum withdrawal threshold is set to $50. This is a little lower than the typical threshold, so that is yet another pleasant discovery. The trading platform is MarketsPulse, which is not a very common platform, but appears to be very intuitive and follows the same basic structure as the more popular SpotOption. The platform is also available on your mobile device. Prominent links on the site allow you to download BinaryTilt’s apps for iPhone or Android. There are 59 currencies, stocks, indices, and commodities available to trade on the site. Types of trades include High/Low, One Touch, Range, and Option on Demand. Option on Demand is a lot like Option Builder on SpotOption. It allows you to choose your own expiry time and customize your trades, which is excellent. The only trade tool that I ran across was early close; the company does not appear to offer double up or rollover. This is not really the end of the world, as early close is by far the most important of the three for profitable trading. Resources for learning are limited to mainly video tutorials, but there are a large number of them covering a wide array of topics in money management, technical analysis, and basic trading. New binary options traders will find an abundance of information in these video tutorials which will help them learn how to trade. The only thing which did not impress me about BinaryTilt was the customer service, which unfortunately is arguably the most important thing. I tried to speak to someone on live chat during standard market hours on a weekday. It should not have mattered what time I checked in; they state on their website that they offer service 24/7. Regardless, an “agent” named Samantha appeared instantaneously on the chat line when I opened the window and put in my contact information. She instantly asked how she could help me. I responded, hoping that this automatic message did not indicate a bot. It didn’t, but there was no live human being sitting there behind the keyboard either. The desk was entirely un-staffed. Half an hour later, nobody had answered a single question. This was quite a let-down in light of the fact that BinaryTilt impressed me in every other way. I had been hoping for the best with customer service so that I could provide a flawless recommendation. I can still give a limited recommendation for BinaryTilt. There is always the off chance that the chat line being un-staffed was a hiccup in normal operations. It is also possible that the company, being relatively new (2013), has simply not been able to get this aspect of their operations running adequately yet. The fact that they are regulated as a financial entity by a real legal authority seems to indicate that they have good intentions and offer service that lives up to a certain standard. The rest of the features for this site are excellent. The site itself is well designed, functional, and easy to navigate. The information on the site is transparent and easy to understand. Hopefully BinaryTilt will get their act together with their customer service in the near future. Until then, they are well worth keeping an eye on. Have a look at their site and try contacting them yourself. You may be impressed.